Lay's Applewood Smoked BBQ. 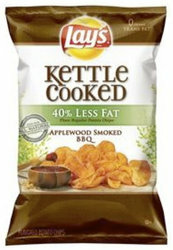 The perfect blend of bold applewood smoke and honey-sweet BBQ all in a Kettle Cooked Chip. These chips are made with all natural potatoes and seasonings and have 40% less fat than regular potato chips.